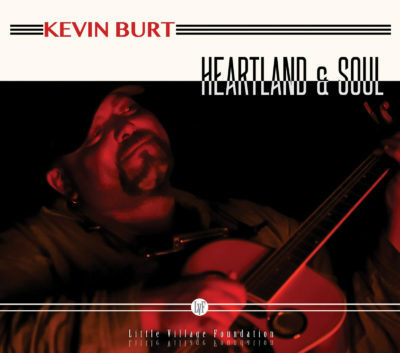 We’re very excited to share this huge musical talent to the world with this much-anticipated, stunning debut recording from Kevin Burt – HEARTLAND & SOUL out October 29th on Little Village Foundation Records! The Iowa based Burt’s vocals are absolutely amazing – extremely powerful, rich, warm, expressive and exploding with SOUL!! Another killer sounding album recorded at Kid Andersen’s famed GREASELAND Studios in San Jose’, CA, with a golden touch from guitarist/producer Kid and producer/keyboard master/Little Village Foundation’s Jim Pugh. The all-star band features an incredible rhythm section with D’Mar Martin on drums, Jon Otis (Johnny Otis’ son!) on percussion, and the bassist to the stars, Jerry Jemmott! Grammy award winning Jemmott is a true living legend, playing on so many timeless soul, blues, & jazz classics, from B.B. King’s “Thrill Is Gone” to Gil Scott Heron’s “The Revolution Will Not Be Televised” to Aretha Franklin’s “Think”- be sure to check out Jerry’s unbelievably rich and varied eye-popping discography. These are all outstanding Kevin Burt original roots/blues recordings, save for a really cool stripped-down but intense cover of “Eleanor Rigby” that the charismatic Burt makes all his own like all true artists do. His award-winning blues harp playing is featured throughout, highlights include the “Wake Up, Baby” and the catchy, upbeat standout opener, “Real Love.” And “Smack Dab In The Middle” starts off with a down and dirty Delta blues feel with harp and slide guitar, and then segues into a monster funk soul groove. Be sure to check out the ultra-funky “I’ve Been Watching You” and “Day Day,” along with his seductive plea to his lady “Never.” This beautiful sounding record will now show the world why this rising star dominated the 2018 International Blues Challenge competition!